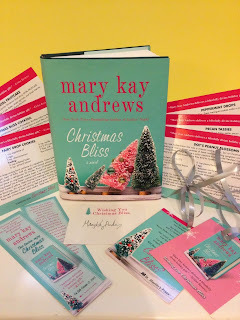 Yesterday, I reviewed a delightful Christmas novel called CHRISTMAS BLISS by one of my favorite authors Mary Kay Andrews. This cute story about two best friends is guaranteed not only to put you in the Christmas spirit but also warm your heart. I am super excited to welcome back Ms. Andrews with another wonderful guest post about the appeal of White Christmas. I hope you enjoy it as much as I did... and make sure you check out the fantastic giveaway! Growing up in sub-tropical Florida, the closest I ever got to a white Christmas was a day spent frolicking on the sandy white beaches of the nearby Gulf of Mexico. I never saw a real snow sled until I was grown and in college, but there was more than one holiday where my siblings and I went water skiing on Christmas Day. Okay—in a wetsuit, but still, it was in the high ‘70s. Maybe that explains my attraction to the movie musical White Christmas, which I share with the protagonist of my new novella Christmas Bliss. It’s a Wonderful Life is grand, sure, and Home Alone, which was a favorite of my own now-grown children is still wickedly funny, but for Weezie Foley and me, it’s always gonna be White Christmas. In the early years, before VCRs and DVD players, I’d eagerly await the night the movie would be broadcast on television, usually the week before Christmas. Finally, nearly twenty years ago, my sister, knowing how I loved the movie, gave me my own videotape of the movie. When technology advanced, she gave me my own DVD. Why do Weezie and I love this film? Don’t know about Weezie, but maybe part of the appeal for me is that it was released the year I was born—although I didn’t realize that until recently. Or maybe it’s the Irving Berlin songs. Every once in a while, when my little sister and I get together, we belt out a screechy version of “Sisters”. Certainly, part of the appeal is the glorious costumes, which were the creation of legendary designer Edith Head. Those smart post-war suits worn by the men and women, and my favorite, the glamorous black strapless sequined gown worn by Rosemary Clooney in her “Love, You Didn’t Do Right By Me” number. 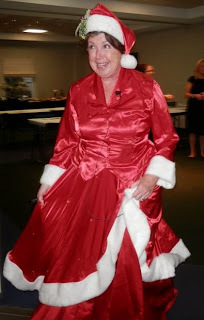 True confession: years ago, when I wrote another holiday-themed mystery, Midnight Clear, I had a costume-maker friend create an identical version of the red satin Mrs. Santa gown Rosemary wears in the movie’s finale. This year, with the release of Christmas Bliss, I’ve dug the costume out and worn it to several signings. In CHRISTMAS BLISS, Weezie’s fiancé Daniel, who has ambivalent feelings about the holiday, tells Weezie is favorite Christmas movie is The Ref. Weezie is appalled by his fondness for such a dark, cynical movie, and her reaction is the same as mine, when both my children professed their love for the Dennis Leary blackly comedic look at dysfunction in the suburbs. Seriously? Is this what they think families are like? Sure, I realize “my” movie is soaked in that syrupy post-war optimism of the fifties. It’s an unrealistic depiction of filial devotion, show business, you name it. Hell, even the snow is laughably fake. But none of that matters to me. To me, White Christmas is about friendship and faithfulness, and ultimately, the triumph of true love. Also? The costumes are way cool. 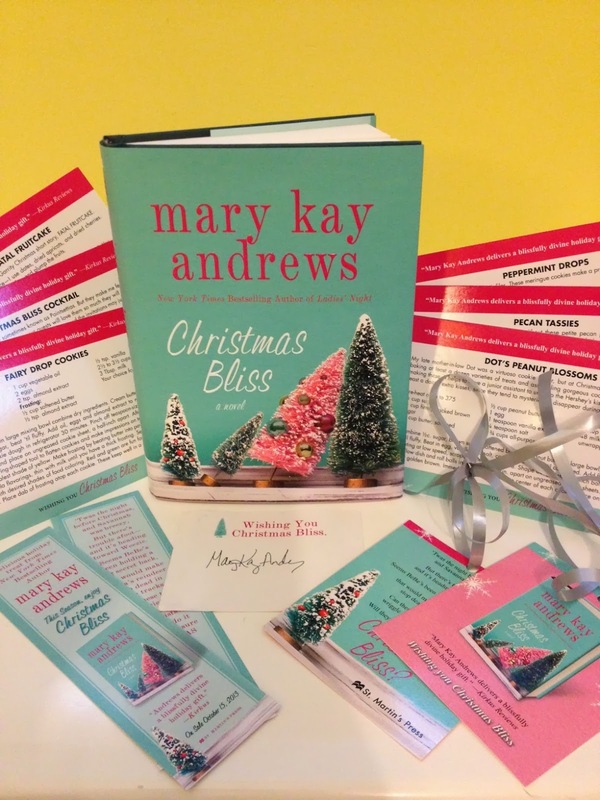 Mary Kay Andrews is the author of the New York Times bestselling The Fixer Upper, Savannah Breeze and Blue Christmas, as well as Deep Dish, Hissy Fit, Little Bitty Lies and Savannah Blues. She is a frequent lecturer and writing teacher at workshops including Emory University, The University of Georgia’s Harriette Austin Writer’s Workshop, the Tennessee Mountain Writer’s Workshop, and the Antioch Writer’s Workshop. Married to her high school sweetheart, she is the mother of two grown children and a proud grandmother. After a brief hiatus in Raleigh, NC, she and her husband moved back to their old neighborhood in Atlanta, where they live in a restored 1926 Craftsman bungalow. She divides her time between Atlanta and her restored beach cottage on Tybee Island, GA. 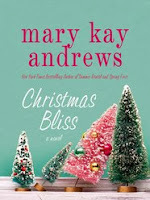 Giveaway alert: I have an awesome CHRISTMAS BLISS giveaway for one lucky Booking Mama reader. Just look at what you can win -- a copy of CHRISTMAS BLISS, a signed bookplate, a bookmark, a set of recipe cards, and an ornament. To enter, just fill out the form below before November 20th at 11:59 p.m. ET. I will randomly select and notify the winner the following day. This contest is open to those of you with U.S. addresses only. Good luck! My mother and I went to see White Christmas when it first came out - I was about 12 or 13 - and loved it! Still watch every Christmas time. Fun guest post! I love the song White Christmas but think I'd prefer a water skiing one! Mary Kay always makes me smile ... love that woman! I really related to watching my Christmas movies pre-VCR! I was lucky enough to see the musical version of White Christmas a few summers ago. My book came today. Thank you so much!